The area here is still blanketed by several inches of snow, the second heavy snow of the season. Another winter storm is expected this weekend, but that means one thing -- spring isn't far off. While the flakes have been falling I've been digging out the camping gear, looking at maps, and making plans for the spring thaw and the first camping trip of the season. A few new pieces of camping gear arrived yesterday. They were actually a Christmas gift from some family members and will compliment the gear I already have. They will also allow me to eliminate some larger and heavier items, and eliminate some plastic utensils. The more condensed the pack, the happier the journey. The better quality the items, the less expense over time when replacement is needed. The first piece of gear I received is a set of stainless steel utensils. I didn't want to keep using the non-biodegradable plastic, millions of pieces of which are already clogging the landfills. So, I opted for stainless steel. 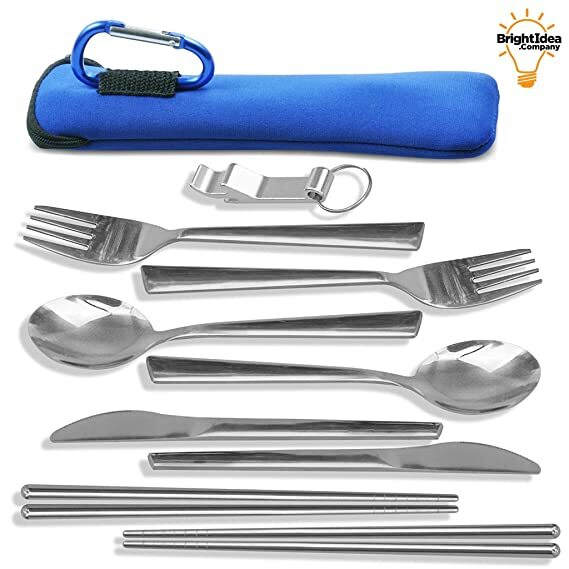 It can be washed and reused many times, and the set I chose, from TravelSource, comes in a handy little case that will clip nicely onto my backpack, should I need to take them with me on a day hike. I will have to practice with the chopsticks though. I haven't used many in my lifetime, but that only adds to the adventure. It will be a new skill to acquire. The second item is a set of stainless steel plates, which are only 8.5" in diameter. They are from a company called Wealers. The plates are smaller and much lighter weight than the plastic trays I had, plus they are deeper and can be used as bowls as well. They come in a mesh carrying case. And finally, there are the stainless steel tumblers, from the same company. The tumblers also come in their own mesh case, and they are compact enough to fit inside the carrying case with the plates, as does the silverware pouch. Hot or cold drinks should work well, but I will need to acquire some silicone grips to hold the cup when it has hot liquids in it. There are still one or two things I need to add to the gear bag that gets tossed into the van for the camping trips. One of them is a wood-burning camp stove for cooking. It will be nice to gather fallen twigs to fuel the stove, as opposed to cutting firewood, or buying it already cut, to fuel a larger fire to achieve the same goal. I have a butane-fuel stove that I bought a couple of years ago, but honestly the butane is costly and a single canister will only run the stove on high for an hour, and it's too bulky if you're going to be packing in to a campsite. I am opting for a small camping stove that can be fueled by simple twigs and biodegradable material that nature can then reuse for its purposes. I am of the mind to make my own. I have been exploring options and there are some nice ones available, but making one might be fun. So, while others are scooping snow and chipping ice right now, I'm sipping tea, editing manuscripts, and planning for the first camping trip of 2019. Lord willing, it will be an enjoyable one. Note: I am not an affiliate of these product manufacturers, nor of the retailers, linked above. I bought their products and will use them. I will place reviews at Amazon as to how they fare this season, and place updates here as well.